Sidi Sanneh: Sabally to Jammeh: "We must hand over power." Sabally to Jammeh: "We must hand over power." 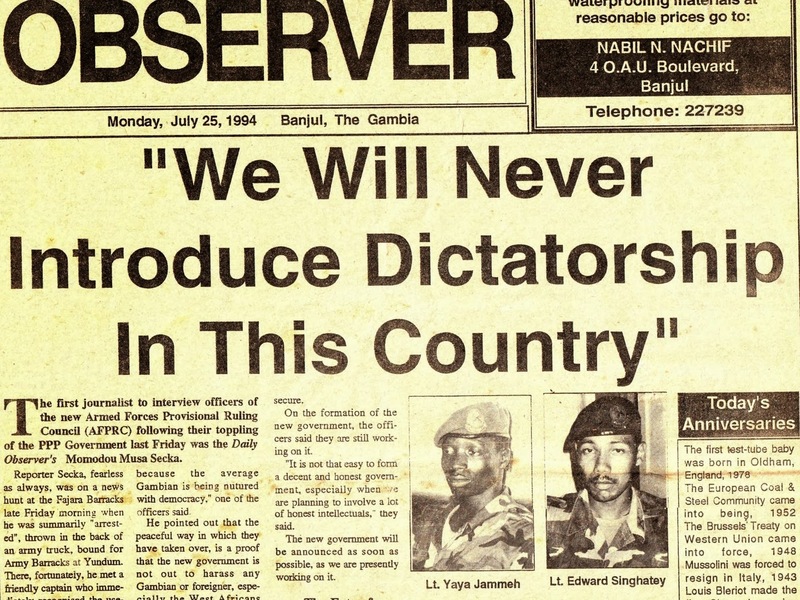 Yaya Jammeh and his band of renegade soldiers who seized power on the 22nd July 1994 did so under the pretext that, as it is almost always with military take-overs, the outgoing government was corrupt to the core, and the rational remedy was its replacement. Immediately following their installment at State House, they immediately commenced identifying potential collaborators who'd help them navigate the maze of what was, in their eyes, an administrative monstrosity they neither comprehended nor discerned as operable without the old hands they succeeded in plucking from the Jawara pool of highly trained administrators. 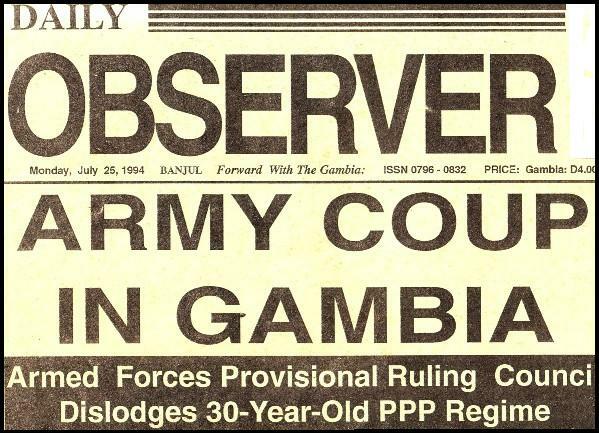 Foremost in the mind of the newly installed Chairman of the Armed Forces Provisional Ruling Council (AFPRC) was to justify the coup despite an apparent public support, gauging from the number of people who came out to welcome the AFPRC members who regularly paraded themselves around the Greater Banjul Area. It was only through such self-promotion that public validation could be secured to allow Jammeh to move quickly to consolidate power and to perpetuate his rule that is now in its 21st year. Anxious to confirm the justification for seizing power unconstitutionally, Jammeh, in receiving the National Consultative Council's Report in February 1995, suggested that among the Committee's findings during its national tour was "the happiness" of the Gambian people that "three decades of self-perpetuating rule by one political party was overturned." Jammeh went even a step further in his broadcast statement that the Committee found that you (referring to the Gambian people) "accorded legitimacy and even blessings to the coup." 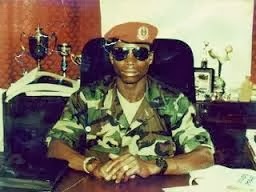 To provide the necessary proof that indeed the Jawara regime was corrupt and the coup a justifiable remedy to what was seen as a decadent regime "living a flamboyant lifestyle along Pipeline Road" while the rest of the Gambian population, including Jammeh and Singhatey, wallowed in poverty. To achieve this end, he sought the legal advise of his Attorney General and Minister of Justice, Fafa Edrrissa Mbai, that set up the first of several anti-corruption Commissions that followed which have become more of diversionary tactic than a genuine vehicle of addressing corruption which has become endemic during the A(F)PRC regimes. According to source(s) familiar with the contents of the Bamfoe Commission Report, its findings concluded that the Jawara Ministers were not living beyond their means and thus deemed not to be corrupt. However, some Directors of Technical Departments, according to the same source(s), were found to be living beyond their salaries could afford and thus deemed corrupt. Obviously, the findings posed a dilemma for Jammeh and Singhatey who had no intention of ceding power back to the civilians. At this point, the combo led the charge with their campaign was in full throttle to discredit the corrupt Jawara Ministers in their Mercedes Benz 200s and "mansions on Pipeline Road" - compared to the pair of custom ordered Rolls Royce Phantoms, at half a million dollars per copy, in Jammeh's current collection of luxury sedan cars in his garage, fueled and operated at state expense - and thus will not let the hard facts presented by the Commission to get in the way of their false narrative. 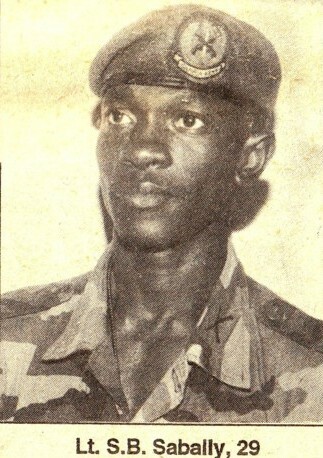 However, according to our source(s), the Commission's findings convinced the then Vice Chairman of the AFPRC, Lt. Sabally, that, in the absence of evidence of rampant corruption - the main justification for the coup - the military junta is left with no option but to hand over power to civilians and return to barracks. The Vice Chairman of the AFPRC made his position known to Jammeh; a view immediately shared by Sadibou Hydara. As the only University-educated member of the military Council, his perspective was quite different. He felt the military was justified in intervening because the previous regime overstayed, even if the Commission's findings did not support the rationale for the coup. However, he felt that at the end of the "rectification" process - meaning the transition period - the soldiers should return to barracks where they belong, and not at State House. Edward Singhatey, on the other hand, was in the Jammeh camp, both of whom appeared to have seized power to reverse the economic and social position of what they saw as the privileged class, made up of Ministers, senior public officials and successful businessmen and women. Both came from very poor families. It is that same social engineering that is still being practiced to this day by Jammeh, driven more by "entrenched anger" - to borrow Ebrima Sillah's term (former BBC reporter) he used in a recent radio interview to describe the behavior of some of Jammeh's security personnel who torture their fellow Gambians - than by rational economic and social policy. It is not clear what was Yankuba Touray's view, the fifth member of the Council. But chances are he would have been on the side of Yaya Jammeh and Edward Singhatey because of his apparent close relations, if not friendship, with the Chairman of the AFPRC. The Commission Report has never been public because it absolved Jawara and his Ministers of corruption. Thus the only persons who have seen the Report are the Members of the Commission, Members of the Armed Forces Provisional Ruling Council and the AFPRC's Attorney General and Minister of Justice, Fafa Edrissa Mbai. At some point in Gambia's history, the the Bamfoe Commission Report will be inserted into the Public Record as one more evidence against the Jammeh regime that was and still is consumed by entrenched anger. What we do know is that soon after Sabally and Hydara voiced their respective apprehensions about clinging on to power, they became the target of intense scorn among Council Members, leading to a power struggle that ultimately led to their arrests on the trumped-up charges of assassinate attempt on Chairman Jammeh. Fabricating charges against opponents eventually became a hallmark of the A(F)PRC regimes to this day. 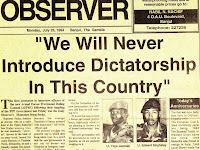 What is also evident is if Yaya Jammeh, Edward Singhatey and Yankuba Touray had supported Sanna Sabally and Sadibou Hydara and handed over power to civilians, Gambia would not be in the current predicament it finds itself; a deteriorating economic condition that threatens to plunge the country into absolute chaos for lack of direction due to bad leadership, endemic corruption, pervasive incompetence and a level of economic mismanagement never seen in pre- or post-Independent Gambia. Yaya Jammeh has proven, yet again, to be an incompetent and chronically corrupt tyrant who deserves to be denied a fifth term by denying him the privilege of presenting himself as a president candidate in 2016. KORA Broadcasting Corporation: What's in a name?